I just received this email from Suzi Brown at Disney. She has asked me to share it with you, our readers. 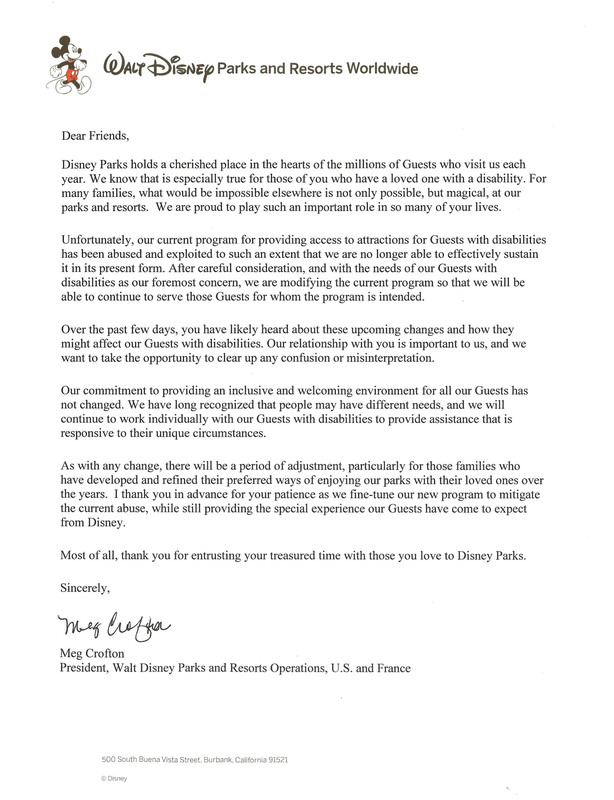 This is the Disney Public Official Statement. i’m not even handi-capped and this upsets me. people abused the system and ruined it for others. ….this change is NOT solely the result of the “pay to play” handicapped renting themselves out to allow FOTL access to the non-disabled. This change is a result ….in large part …to the disabled community abusing the system …with their general assumption that a GAC gets them FOTL access. It’s also Disney’s fault too …they administered the GAC improperly and created the monster. But now …the system is being reeled in …to comply with ADA Laws and, access systems that are in place at other amusement destinations …and everyone says it’s ‘ruined’? ….people really need to READ the ADA Laws ….seriously. If they did …they’d find that that nowhere in the laws does it state that because a person is disabled …they can demand that the moon and the stars be laid out before them. Yes it seemed like you could just bring a wheelchair and use it even if you did not really need it..but If I ever went back again..I would need a wheelchair. That’s a lot of walking for lumbar pain!